Store - Libertys of London/Meshy Bishes. Being a Londoner, born & bred, shopping in SL.... I love the fact this next store has LONDON written all over it!! 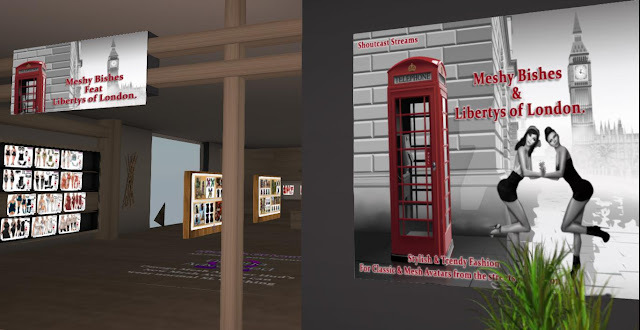 Libertys of London has a variety of clothing, from casual to club wear for Classic SL avatars & the newer Mesh avatars! Stemming from a small club label back in 2008, Liberty's has grown over the years, Jaimee Benelli & Mavish Demina (RL & SL Friends) have really listened to their customers needs, they started custom designing clothing for their Premium Club, SLStringfellows..... People began requesting items. They both knew they could make clothes that were just as good as the ones in the clubs mall, So they decided to go into SL fashion full time and launched Libertys of London creating styles that they would wear in RL with a London flavour! The store was successful enough to be in the destinations guide and had a main store, an outlet store and a club Stages and Stage2 along side it! Coupled with a few other stores along the way like Jai's creations, where Jaimee tried out some "edgy" designs and ones that maybe didn't quite go with the main stores lines, but Jai wanted to let people try out so it was like a testing area for the main store. Sadly moving in RL to another country, having a baby and other RL stuff, Jaimee & Mavish had to close the in-world presence but kept the marketplace going to keep the style and name there and now they are bringing it back!! Wow thank you, finally someone has made a mint green dress that isnt a formal one. I love the colour of this dress but unfortunately designers in SL seem to not use it enough. The textures are really cute and you could wear this out clubbing or just hanging around the house. You could even wear this as a tshirt with some jeans. I have the Slink Hourglass mesh body and this works with the Omega applier system and had no problems with it and it looks great on my mesh body or the normal "classic" skin as they are now called. Well done to Libertys for making colours that others dont, maybe designers like Blueberry should take note? Fashion in SL is currently at the most important evolutionary phase of its life with more and more people moving to mesh bodies its more important than ever now that designers move towards this way of thinking instead of keeping on with just turning out clothes for just classic avatars or just mesh ones.